Often called the alternative capital of Australia, Nimbin has a large population of people looking for sustainable alternatives to the current economic system. Nimbin has its own alternative currency, Nimlets. The Rainbow Power Company, a local initiative, is into alternative energy systems like, solar power, wind and water generators. We have our own permaculture center and many organic growers whose fresh produce can be bought in the local shops. Rainbow Power Company is a specialised manufacturer and distributor of renewable energy equipment. This site contains information about Renewable Energy, (Solar, Wind, Hydro & Biomass), RPC & associated companies, our history, building, products and services. Permaculture Education Centre and ERDA Institute. 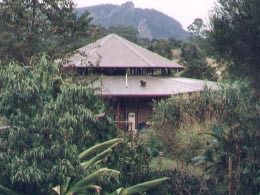 Many come simply for a short visit to our resource centre or to do a tour of the gardens, eco-buildings and working Permaculture systems at Djanbung and Jarlanbah, others to participate in our training programs and internships or experience Earthwise living through Wwoofing and farmstays. The Flowtrack Wind Turbine is a 5KW, up wind, horizontal axis, two bladed machine. Completely designed and manufactured in Australia, the Flowtrack combines the computerised aerofoil design of the blades from Newcastle University with extremely robust inductive generation. Earthmakers of Australia are committed to creating sustainable practices that produce cleaner, healthier waterways and return value added biomass for soil improvement.